Lightweight, but strong; folds and sets up easily, excellent product and value!! Mother in-law already has two folding foot stools. We order only one at this time. We have a 4x4 pickup truck. Hard for some of our friends and or family to get into the truck. This footstool works great at helping them into the truck. Folds up nicely and goes behind the seat. Also used as a flower/plant stand, and use in the kitchen for that just a little extra height. It's sturdy. I'm quite pleased. I need to reach a cabinet at work that's just a little too high for me. This step stool is just the right height and fits in a narrow space. I use it to reach spots I can't, only 4'11". I use it to help a 103 year old lady to get in to my van. Great outside to wash windows. I love it. I can tuck it away in a corner or behind almost anything and it's so lightweight my two year old granddaughter can carry it around, set it up and fold it up. I keep this in my kitchen for an extra boost to a top shelf. My grandchildren also love to use it to reach snacks, etc. Lightweight, easy to move around and sturdy. I love this. I've had mine for over a year, and use it all the time, and it still looks and works like it did when I first used it. And I really love that it folds up, because it makes for easy storage. I am always taking it to room to room, since I also use it for out top closet shelves that have 3 shelves above the clothing racks. I highly recommend this. I use this step stool in the shower with a transfer bench. It enables me to put my feet up and reach my toes. Safe and waterproof (being that it is plastic). Just right height for job. I have 2 of these I is in the kitchen and the other I keep in my truck for shorter people to step on to get in. This stool is a great help in the kitchen. I cannot reach the upper shelves in my cupboards, and this allows me to reach things easily. I have just ordered another stool to use on the second floor to reach shelves in the closets. It is so easy to open and close, and takes very little space when put away. 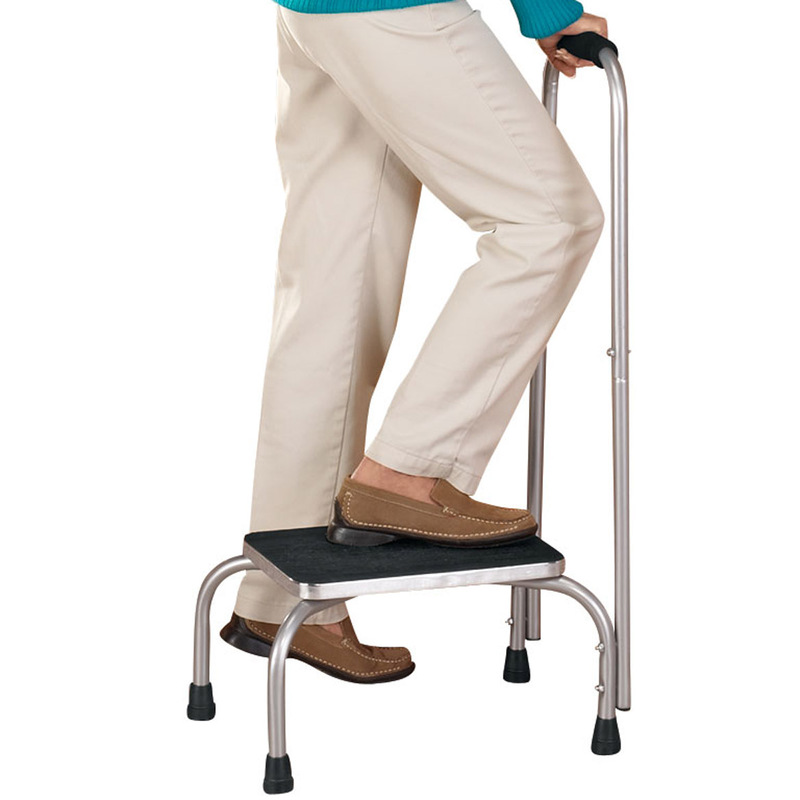 The stool feels sturdy, and gives just enough extra height to allow a "short" senior to reach items on upper shelves. A really good product! -Gives me that boost needed for shelves without dragging around a larger type. -Could be used as a small footstool, setting a flower pot on. -Stores easily in narrow space between wall and fridge. Would be a great gift! I bought this for a friend who is handicapped and has a hard time getting to slightly high places and this works great and is very steady. This little stool is so convenient and sturdy. I have used it again and again. Even my husband who is over 6feet tall uses it once in a while and it supports his weigh without a problem. It's easy and safe to use anywhere in the house. My grandkids even use it at the bathroom sink. Use to get up and into the rear of our SUV. Love these little stools. They come in very handy. I store them in the closets so they are right there when I need to get something off the closet shelves. Well made, sturdy and great space saver for small kitchen. I purchased one of these from a local business who then stopped carrying them. I loved that one so much that I bought another one for my husband to use in the garage. He loves it - uses it for a lot of things when he doesn't want to drag out a big ladder or step stool. Would definitely buy again. I am very short. I use this step stool mostly to get laundry out of the washing machine. Also used to get products from the lower shelf in garage next to the washing machine. 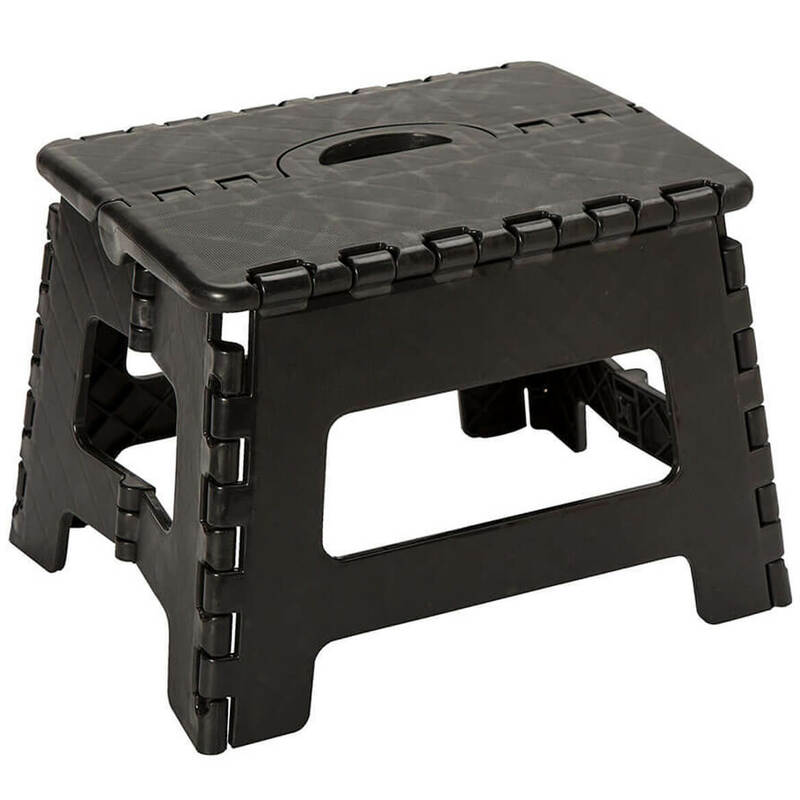 This folding step stool is a college dorm room essential! It takes up very little space since it folds up and can be kept under a bed or behind a dresser until needed. It can help students reach things high up on closet shelves without having to stand on unstable chairs that rock backward. That way, students can use all their available storage space effectively without having to bypass shelves because they are hard to reach. It is sturdy and well made. This stool is tall enough for me to reach whatever I need to. I have 3 now - two in the house and 1 in the apt. I'm lost without them and Grandson knows right where it is when he wants to use it too!! This product will be used frequently. It is easy to move around and very sturdy. Does it's job and then some! 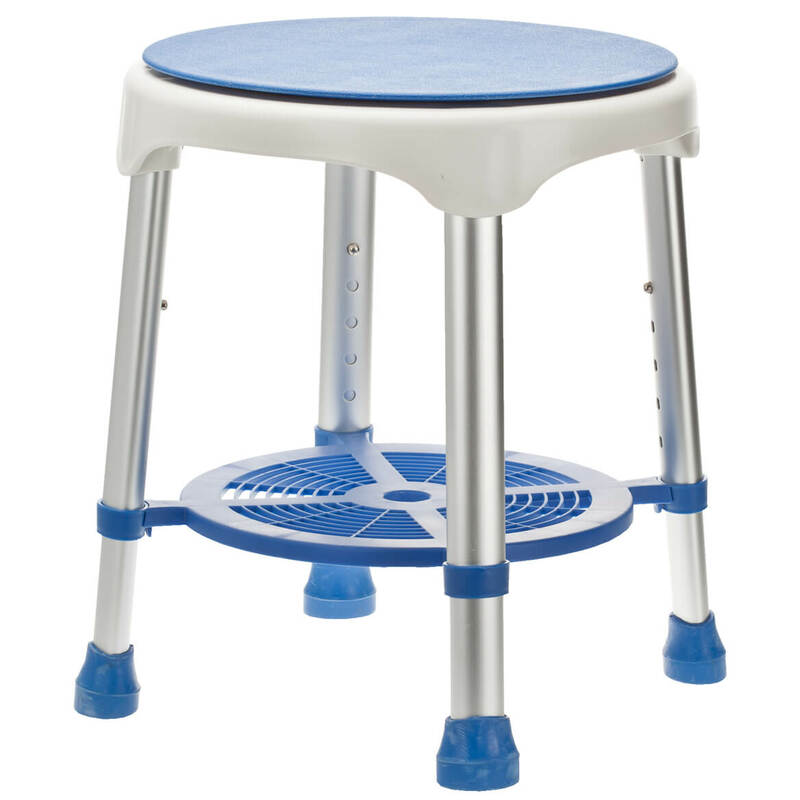 I purchased this stool for my 3 year old grandson to use when he needs to go potty at my house. I needed something that would store away compactly as space is a premium in our old farmhouse. He LOVED this stool, and carried it around our entire property. He named it Trans, because it is a transforming stool, and it became a member of his Transformer arsenal. He even put it beside his bed when he had a sleep over at our house. It can also double as makeshift chair for him. Well worth the price for the entertainment value! This little stool collapses easily to put out of the way and opens just as easily. It is so sturdy even an <280 lbs person can stand on it safely. I gave it to my daughter to go in her trailer. It folds and tucks away in a small place. When need to reach in my closet. Better than begging my husband! Great helper in the kitchen especially for height challenged people like me! Perfect for the kids getting onto the bed in the camper and reaching the top shelves in the house. Ideal for use with elderly in bathtub. Opens and closely so easily one wonders why it took so long to invent it. I needed this stool in my job and I need to move quickly. It is so easy to grab and go. Sturdy too! Use this any where I need a little boost very handy. Strong, sturdy safe has rubber feet. Good product. Additional aid for the aged! I love it because I am a senior citizen and it gives me added support when entering and exiting our van automobile! I am also short in stature and it helps me reach the out of reach places! The greatest and handiest little stool. It is great and handy when trying to reach higher places like the top of a closet or cupboard. Does not take up a lot of space when not in use and is so easy to use. I use this in my kitchen to reach my upper cabinent shelves. It folds away very compactly for easy storage. 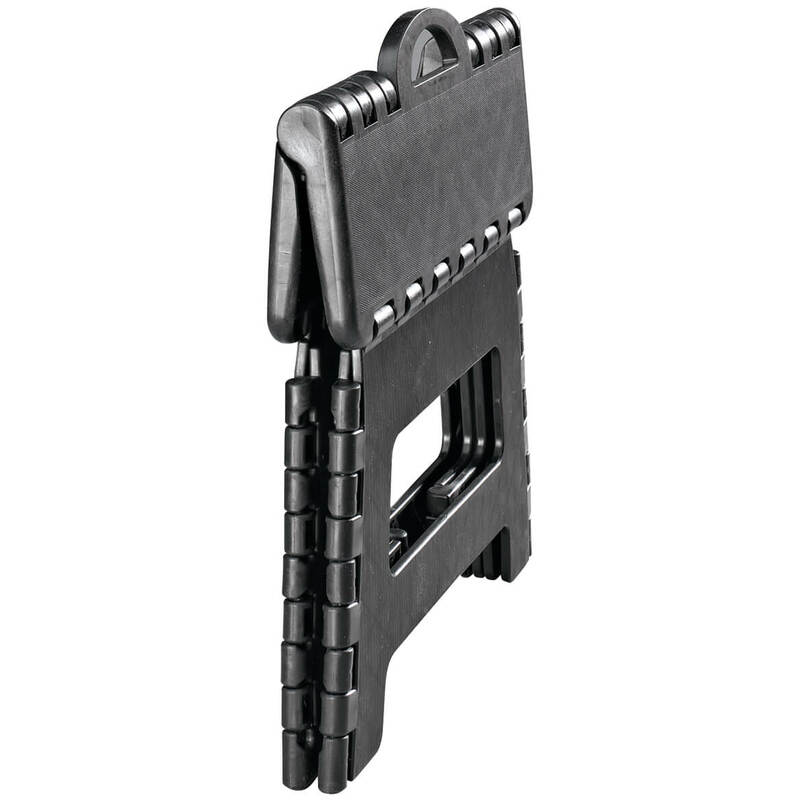 I am not a light-weight person and I worried a folding step would not be sturdy, but I feel very secure on it. It needs to be folded carefully though. I have pinched my fingers several times. I love this Step Stool! I need a step stool to reach the higher cupboards in my kitchen. I love the way it folds so that it doesn't take up much room. It is nice help with a high step into a van. I use this step stool when cleaning higher places than I can normally reach. Also, when traveling, we use two for our lab dog feeding/drinking dishes to raise them up for his convenience. Great for short people, like me. I use this in my office as a foot rest when I type and to get the items in my office or kitchen that are slightly out of reach. Love it because it folds so easily and flat. Requires no storage space when out of use, because it folds flat. I'm instantly 9 inches taller! As a not very tall person, I've never been able to access my upper cupboards. Small kitchens do not allow storage of larger step stools. This fold-away is perfect. I fold it, slide it into its niche, and it is always ready when I need it, but not in the way when I don't. I like that I can lock it safely into position before I climb on it. Bought 1, then bought 2 more! I initially bought one and liked it so much I bought 2 more. One is in the kitchen to reach higher cupboards. One is in the bathroom for the smaller grand kids to reach the sink. The third is on the second story so is handy for whatever. This stool is used to help step up into a high vehicle. Since it folds, you can carry it with you when you travel with someone else. Of course, the other person has to pick it up off the ground since you are already inside the vehicle, but my husband does not mind. I love it. I needed a stool to reach the top shelf in my pantry, but I had no room to store one, and I didn't like hauling a kitchen chair across the room. This folding stool works great, and doesn't take up much space at all when I'm not using it. 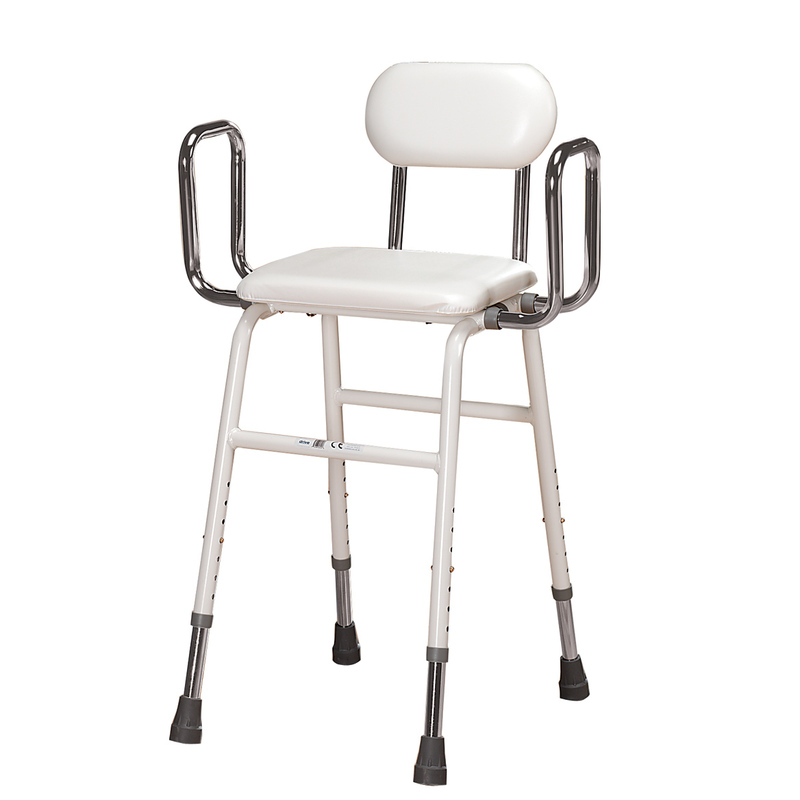 Great folding step stool or elevation stool under commode. White goes with anything w/out it sticking out like a sore thumb or so obvious. Cleans easily. It's small & compact & stores easily. Definitely recommend! The step stool proved invaluable in getting the house decorated for the holidays. Didn't need to get out the ladder at all. As an added bonus the box that the stool was delivered in was sturdy and just the right size to mail gifts to out-of-state family. It is a small stool ,and it comes in handy. Slim, sturdy, easy to store. I am a home organizer and use this product frequently on the job to reach into cupboards, high shelves, etc. One of my customers liked mine, so she ordered three for different areas of her home. I don't know why it took me so long to purchase this stool! I have a SUV & I'm disabled & have a hard time of getting in. I just needed a little boost & this is the perfect stool for me! It's lightweight & folds flat and I can store it under or behind the seat! Love it! Use this all the time in my kitchen. Handy Dandy. It seems I'm always needing to get just a bit higher to do things around the house and out on the porch. these are so handy to use and fold up and out of the way when done. I love this Step Stool. I use it beside my bed. I have bed a little high and put flowers up in my livingroom. It is very strong. I use this in the office when I need to reach something that is out of my reach. This stool is small enough to keep handy and sturdy enough to trust. I really love this Step Stool. It is very steady and strong. I bought it to use at work. I wanted to rest my feet on it while seated, but now I use it at home as well. I love it and will get another one: there are tens of ways to use it everywhere. I showed it to ALL my co-workers, including my bosses and to my friends. Everyone should have one or two at home: it folds easily to really flat, has a perfect handle to carry and it is SO light - plus it's inexpensive. Congrats Walter Drake design team and THANK YOU for this useful work of art! I mean it - because it is not only handy, it is pretty and decorative as well..
Great inexpensive device that folds away easy and allows you that extra step you need when reaching in on a pick up bed or suv. The step stool holds my weight and that is great. Now I can get into bed and is great for reaching for something up high. Stores easily and out of sight - readily available when the grand kids come for reaching the sink. Turns out to be exactly what I was looking for!! It allows me to reach shelves that were difficult before. It's so easy to use, and then folds up nicely for storage. Very pleased so far. Thanks! Very handy to have for that little boost up. It is small and folds, so it slips behind stuff for storage and easy access. I am too short to see out the peep hole in the front door. I can grab this folding stool and hop up to see who is at the door. Then it folds up easily. 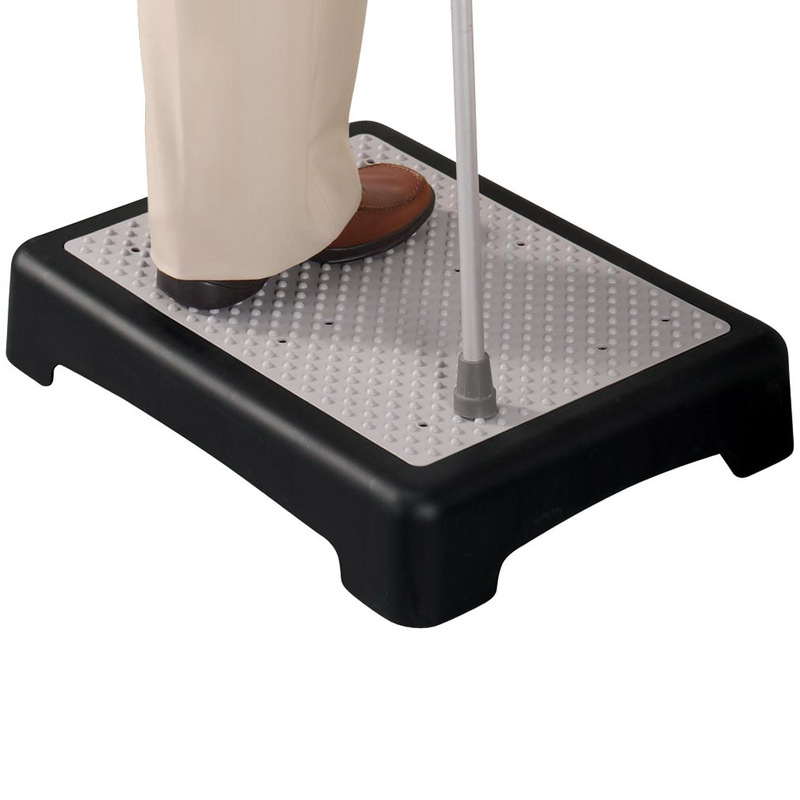 just wanted to let you know that my EZ Step Stool is the greatest item ever invented.I find it to be very practical and being a large person of over 200lbs.I'm not afraid in the least to step on it,also it's so convenient because I live in a 12X16 cabin and don't have a lot of room,but I'm so happy that it is easy to fold and take it out as often as needed.Thank you again and many mahalos!! !from Hawaii. Quick, easy to use and does what it needs to do. I recently purchased a truck that was a bit high for my 80 year old mother to get up into easily. This step is quick and handy to use and makes the step up into the truck a lot easier for my mom. It works great! I would like to have one that is two steps with a solid back. To reach a little bit higher. Want it to be sturdy. The stool "lives" on the outside deck - useful for climbing on to reach hanging bird feeders! I have one of these with nonskid pads on top that my 1 1/2 yr old grandaughter uses to reach the bathroom sink and carry out to sit on, so I thought I'd get one for her to have at her house. It has numerous uses because it is so convenient to store and carry. Despite being so light weight, it is very sturdy - handles adults under 250 lbs. Fits the bill in my kitchen. Good for reaching high cabinets. Easy flat storage next to frig. I use the step for older women to get into my Chyler Aspen The car is too high for shorter peope to step into it. The stool folds up and is easly transported. I use this stool often. I keep it in the kitchen to use to reach upper shelves. I use it to dust the top of the ceiling fans. I use it outside to sit and pick the blueberries. I an lost without one so I keep one on each level of my house. I keep it in the kitchen, very handy. It folds up so I can slid it in a small place for when I need it, very handy. I needed something portable to help me mount my horse away from the barn. This stool is just what I needed. The right height, sturdy, compact, and rugged enough to endure the ride. Worth the price, which was not expensive. My wife is rather short and uses the stool to reach th pull downs on our front curtains. It seems sturdy enough. It could be a couple of inches taller. I was pleasantly surprised to find this sturdy enough for me. I was afraid it would be shoddy, but it seems to be well-made and very easy to store upright. It opens with one hand. I like everything about it for use in the kitchen and garage. My wife is shorter than me and it doesn't work as well for her. I'd prefer one that's a few inches taller. The folding step stool is everything it claims to be. Easy to use and one step to store it away. i use my step stool everyday in kitchen or where needed. i like that it folds and i can carry it through out the house for use anywhere. it's small but very sturdy and well constructed. i think it said it holds up to about 300lbs. 9" boost not enough. Stores nicely. Hoped to get boost to the top shelf in my clothes closet. Not so much of a boost really. its okay but wish it would have been little bit higher. I need a stool to reach my upper kitchen cabinets and this looks perfect since it folds and would take less space. Nice a easy step stool. Folds up pretty flat. Very handy and easy to store. To change light bulbs out of reach. this should give her a boost. For a friend to help her get in her truck. Have one now and use it all the time so I ordered another one. Need this in my kitchen to reach top shelves. I am short and need an extra step up to reach top shelves. Need step stools of different heights in different rooms. I have a step stool similar to this one and I wanted another one. I use the step stool in the shower so I don't have to bend over so far to wash my feet. Good size and price. Looks handy. I needed a step stool for our van to help older people step up and into our van. I need this to reach items on the shelves over my garments. Thought it would be great to keep in kitchen and fold up out of the way. Very handy and strong. Also fits in my suitcase, so I can get into those high beds without trouble. Help me get into bed. I am short of stature and this will be easier for me. Ordered one for 4 yr old to reach sink. Need another for bathroom. I'm disabled & short to boot & I have a hard time getting into our SUV. This is exactly what I need. Can fold it up & stash behind my seat. I have one and it is incredibly convenient. I need one for downstairs! We had one of these in our camper and it worked well. Wanted one for our house. The description talks about 2 different stools. How do I know which one to order? You do not have a place to select which style. You only allow a color selection under "style". BEST ANSWER: Thank you for your question. 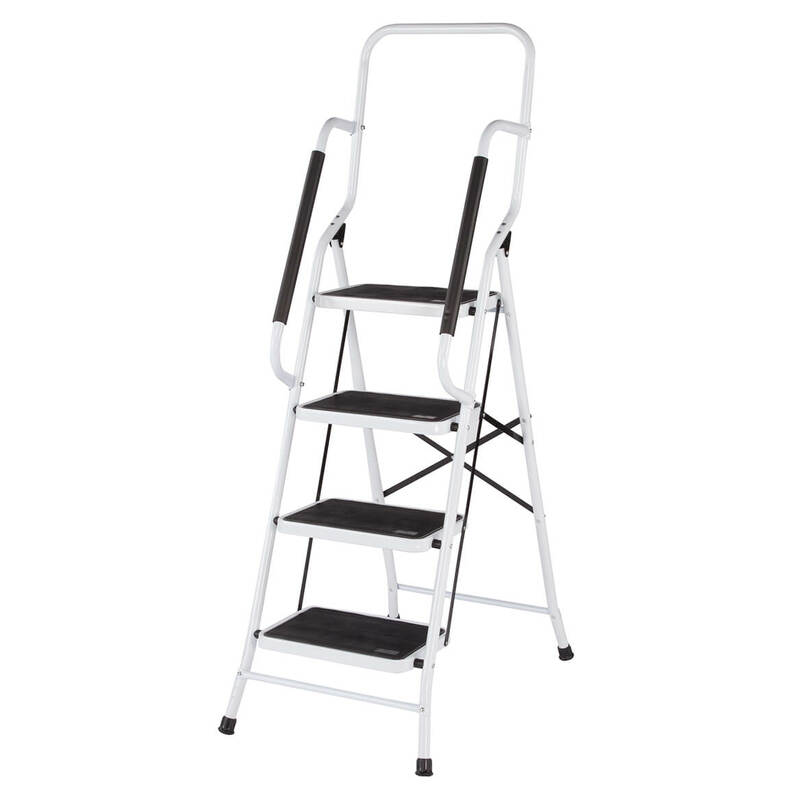 The Folding step stool is the 9" high stool has 9" x 11" surface. Folds to 2"W. At this time the deluxe step stool is not available. We hope this information will be of help to you. 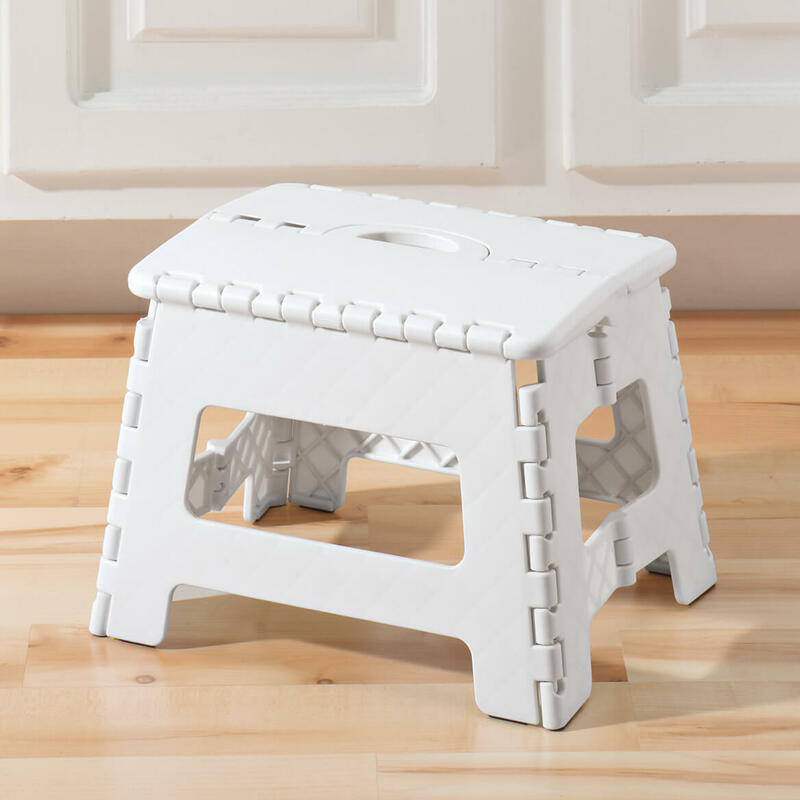 How tall is this step stool 311826 White? BEST ANSWER: Thank you for your question. It is about 9" tall. We hope this information will be of help to you. BEST ANSWER: Thank you for your question. This item is not made by Samsonite. We hope this information will be of help to you. Where can I purchase this stool in San Jose, Ca?